Why, oh why didn’t someone tell me how much fun self-striping socks are to make? I’ve done lace socks, cabled socks, plain jane socks (although those bore me), ribbed socks, you get the idea. I’ve even done socks with yarn that kind of sort of stripes if you squint at it just right. All this time I’ve been hiding the three skeins of self striping yarn that I own in the bottom of my sock yarn drawer waiting for it to be something else entirely. I can’t really tell you why as they’re all beautiful colors, I just didn’t think I liked them as socks. A shawl, maybe. Fingerless mitts, maybe. Kind of like the kid who won’t try any green vegetables because they don’t think they’ll like them. Little Women castlocally. So I went on a yarn hunting expedition. I didn’t find any of the Trekking XXL in colorway 550 that she was looking for. But I found other colorways, beautiful, less rainbow-y colorways. Not that there’s anything wrong with rainbow colored socks, it’s just not my style to wear that bright of socks. See, they’re the green vegetable of my world (except I really like green vegetables). 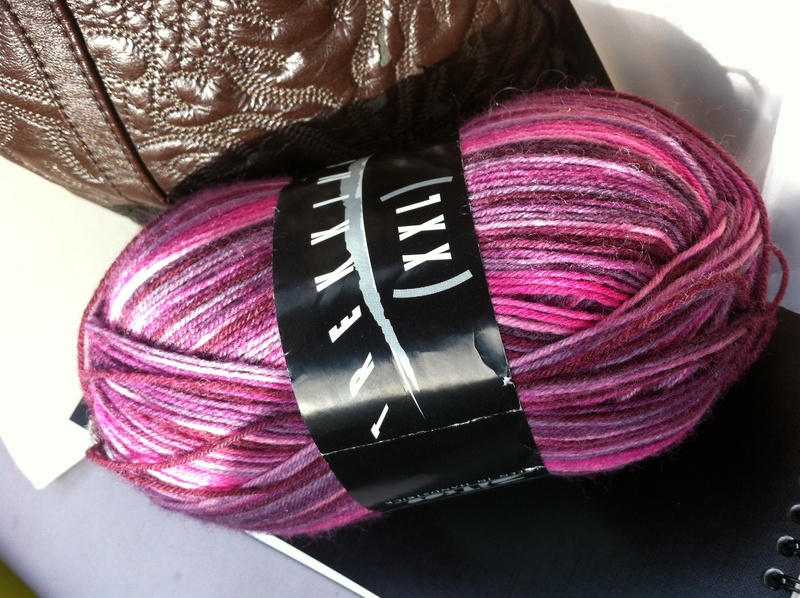 So I bought one skein. Just one. Because I was afraid it would get buried in that same drawer. And Little Women came along. I spent much of the play backstage helping the lead actresses with their costume changes. Since it was dimly lit and I needed to listen for cues, I needed something stupidly easy to knit. Something so easy I could literally do it in the dark. Enter the Vanilla Sock from the Knitmore Girls. And lo and behold, a sock was born. Then two. In the two weeks that the play ran, I finished two socks. This may be a personal record for me. They were even sized larger (to fit a friend) than I normally would make for either the girls or myself. And here I thought I was a slow sock knitter. Awesome!! And hooray for trying something new & different 🙂 I loves me some self-striping yarnz. In fact, I’ve got a pair of stripey socks on the needles right now! So nice to read your blog…. I need to get back to mine soon. Thanks, knittymuggins! The stripes are rather addicting! I miss your blog, hope to see you write again soon. Previous Previous post: Who Wudda Thunk?